Last result : Spin Orbit Twisted Spin Waves : These past years, we have studied the interplay between Coulomb interactions in a magnetized 2DEG and spin-orbit coupling (SOC) arizing from bulk inversion asymetry and structure inversion asymetry. We found novel physics which opens the possibility to control the group velocity of spin waves in a conducting magnet. Phys. Rev. Lett., vol. 117, p. 137204, Sep 2016..
(a) Raman incoming (Ki) and outgoing (Ks) photon wavevectors. q is the in-plane momentum of the spin wave probed by the Raman process. The amplitude and direction of q are controlled by theta and phi, respectively. The magnetic field, parallel to ez, is always perpendicular to q . Bottom plane : the spin-wave oscillation in real space is associ- ated with an out-of-phase oscillation of the two Fermi disks in momentum space with respect to their equilibrium positions (gray circles). Electron spins remain parallel or anti-parallel to B. (b) Illustration of the spin-wave twisting caused by SOC. Bottom plane : the momentum-space motion twists the spins with respect to their equilibrium positions (gray vec- tors). A z-spin-current parallel to q0 appears. Top plane : the spins now evolve in a moving wavelike reference frame (highlighted by the blue shading). 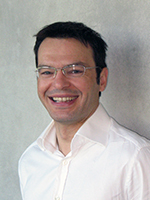 Consequently, the spin waves are twisted with a phase q0 · r.
Florent Perez is currently associate Professor at UPMC. He is an expert in charge and spin excitations, many-body phenomena, of low dimensional electron systems. He spent most of his research activities doing Raman spectroscopy on electron gases confined in semiconductors or semi-magnetic heterostructures like quantum wires and quantum wells. This last decade, he has obtained important results in studying spin waves and chiral spin waves in doped CdMnTe quantum wells using electronic magneto-Raman spectroscopy. He authored and co-authored 40 papers mixing theoretical and experimental results. He has been invited to international conferences. He collaborates (or collaborated) with theoricians from the University of Missouri, the University of York, with growers from the Warsaw Academy of Science and from the Institut Néel, and with experimentalists from the University of Bath, the King’s College London, the University of Michigan, the THz group of the Laboratoire Pierre Aigrain and the Spin Physics group of the Laboratoire Charles Coulomb. If you are interested in joining this activity, please, look here.